First out of the blocks is Surf Air, which is bringing its popular airline subscription members’ club, founded in California in 2013, to Europe from 23 June. Its UK base and Signature’s FBO will be London Luton Airport. CEO Simon Talling-Smith announced at EBACE its AOC partner will be FlexJet-owned FlairJet, in a nod to the operator’s years of experience flying the Embraer Phenom family. Surf Air Europe will initially fly the Phenom 300 (up to eight seats) to Ibiza and Cannes before adding other UK and European destinations such as Zurich and Rome. It then plans to widen the offer with single-engined Pilatus PC-12 aircraft from the autumn. Talling-Smith said: ”In any industry, you get these moments in time where you bring together a new regulation, a world-beating technology and a new business model. You put those three things together and you can really make something special. We think the combination of the new SETops rulings, the PC-12 and Surf Air is that triangle. The PC-12 will allow us to offer an incredibly low entry price point.” Surf Air’s joining membership fee is £1,000 a month, plus £1,750 a month for the short distance, 1hr routes, and that’s for unlimited flying. The jet share (longer routes) will be £3,150 a month. Continuing the trend, Textron Aviation announced an order from Waves Technologies for a Cessna Grand Caravan EX utility turboprop to start on-demand air taxi services from the Channel Islands. The Guernsey-based service, headed by Nick Magliocchetti, is poised to launch in August, flying customers to and from the islands using a state-of-the-art reservation system that allows customers to reserve flights in real time based on user demand. Meanwhile, SETops pioneer Hendell Aviation of Finland flew the first commercial SETops flight from Blackbushe in the UK to Lausanne last weekend, just days after announcing at EBACE, together with its Swiss partner Fly7, its plans to establish a UK base. 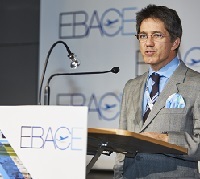 Speaking at his first EBACE, new EBAA CEO Brandon Mitchener highlighted the industry is growing, after years of sluggishness. ”An expanding range of new aircraft, state-of-the-art technologies and new business models are all contributing to the vitality ” he said. The 1 March approval of commercial single-engine turboprop operations IFR and the innovative new EASA CS-23 rule which supports a performance-based approach to certifying piston-engined, turboprops, light jets and even new hybrid and electric propulson aircraft, is helping to widen out the sector. A session on how Brexit will affect business aviation highlighted that Britain must fight to keep the status quo in aviation, an essentially collaborative industry. CEO of Luxaviation UK Patrick Margetson-Rushmore stressed that the UK wants and needs to continue supporting EASA in terms of regulations and finances. Marc Bailey, CEO of BBGA, said the unification of the industry on Brexit was well under way, bolstered by commercial aviation, which has the same needs. Giulia Mauri, a partner at Pierstone lawyers, said a customer recently had a new clause added to a contract concerning an aircraft delivery due in 2020 in case EASA regulations should not apply by that time. At EBACE’s first Careers in Business Aviation Day, 250 high school, vocational and university students from 120 centres of learning learned about jobs in a field they knew little about. “This is a very people-intensive industry,” Simon Witts, founder and CEO of Aviation Skills Partnership, said. He noted the industry is facing a critical shortage of aviation personnel. “If you’re trained in Switzerland, you can work anywhere in the world,” he told them. Orders announced at EBACE included the UK’s first Piaggio Avanti EVO to an undisclosed customer (BTN last week). 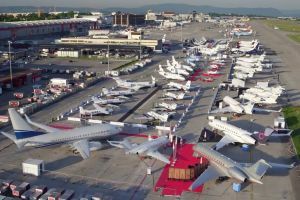 The deal was arranged by UK distributor ConnectJets, which will now help to secure an AOC partner ahead of delivery in the fourth quarter of the year. 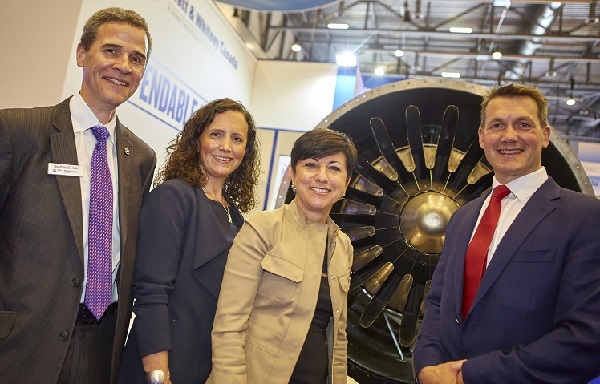 Farnborough-based VIP charter operator Acropolis Aviation returned to EBACE to announce the selection of CFM International’s LEAP-1A engine for its new Airbus ACJ320neo and a contract with Switzerland’s AMAC Aerospace as cabin outfitter. CEO Jonathan Bousfield said AMAC was the best suited to bring designer Alberto Pinto’s ‘vision to life’. 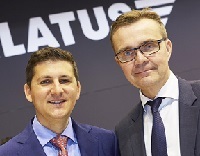 Airbus Helicopters announced the creation of Airbus Corporate Helicopters, a new brand for its expanding private and business aviation customer base. Embracing engineering support, design specialists, support specialists and sales and marketing experts, ACH will have its centre of excellence at London Oxford Airport. Airbus also launched a private jet version of its A330neo, combining new-generation engines and aerodynamic and other improvements to offer what it described as even more comfort, efficiency and a ‘nonstop to the world’ range. Piper Aircraft celebrated EASA certification for its new M600 $3m turboprop following a 15-month certification programme, while Pilatus announced it would re-open the order book for its popular PC-24 light jet later this year. It announced the twinjet four years ago and sold 84 units in three days. Other highlights from the static show included the all-new Gulfstream G500 and the newly EASA-certificated Cirrus Aircraft SF50 Vision (Personal) Jet, priced at just under US$2m. Already with a 600-strong order book, it features a full-airframe parachute, a first for a turbine-powered aircraft. Aerion, whose supersonic business jet was first announced in November 2007, finally announced GE as its powerplant partner. Signature Flight Support announced the expansion of its Elite Class service, currently available at its Gatwick Airport FBO, to commercial airline passengers departing its newest VIP London Luton Airport FBO. Elite Class enables airline passengers to check in, clear customs and enjoy the luxury facilities just like passengers flying privately. Chauffeur transport to the awaiting commercial aircraft is included and Signature handles the luggage.